Prior Park Landscape Garden will be playing host to Bath’s World Heritage Day celebrations today – Sunday April 19th. This popular annual event is now in its sixth year, and has been held at locations around the city. This year the theme is the landscape setting of the World Heritage Site, which can be appreciated perfectly at Prior Park Landscape Garden on the southern slopes overlooking the city. Prior Park was built in 1742 for Bath’s most famous eighteenth century entrepreneur, Ralph Allen, who was keen to have a country house from which he could admire the beautiful city constructed of stone from his mines at nearby Combe Down and Bathampton. Considered an advertisement for Bath stone, Prior Park was later described as ‘a noble seat which sees all of Bath and which was built for all of Bath to see’. Prior Park’s 28 acre garden was originally laid out by Allen’s friend, the poet Alexander Pope. In the 1750s and 60s Allen instructed Lancelot ‘Capability’ Brown, the most influential and fashionable landscape architect of the day, to re-design the site. Amongst the many activities planned for World Heritage Day visitors will be able to meet and stroll with Ralph Allen, Mrs Allen, Capability Brown and John Wood, architect of Allen’s mansion. Tony Crouch, Bath and North East Somerset Council’s World Heritage Manager, said: “It is easy to overlook the contribution that the landscape setting makes to the city, but imagine Bath without the surrounding green hillsides. Here we have world class architecture running seamlessly into countryside of outstanding natural beauty. This is a rare and precious combination.” Making the most of the garden’s fascinating features, visitors can enjoy a range of activities around the garden from 10am to 4.30pm. Visitors of all ages can have a go at landscape drawing, painting and photography; join a Skyline walk or a mini guided walk of the garden; take in the view from the portico of the mansion; dress up as a Georgian and have a go at country dancing; listen to traditional music; go bug-hunting; find out about ant hills, wild flowers and butterflies; and discover more about the history and archaeology of the area from experts and local organisations. World Heritage Day is organised by Bath & North East Somerset Council in association with the National Trust and Bath Preservation Trust. Entry will be free to Bath & North East Somerset residents with a Discovery Card, and to National Trust members. All activities are free of charge once on-site. Visitors can enter the event from Ralph Allen Drive and from Church Lane. There is no car parking for the event but there is a bus stop on Ralph Allen Drive and the Church Lane entrance in Widcombe can be reached on foot in 20 minutes from the city centre. 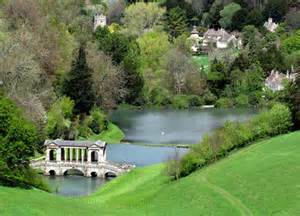 The Mayor of Bath’s Honorary Guides will be offering free guided walks to Prior Park starting outside the Pump Room at 11am and 1.30pm. FOR INFORMATION: International Day for Monuments and Sites (World Heritage Day) was established by the International Council on Monuments and Sites (ICOMOS) in 1983, to celebrate and draw attention to the need to preserve cultural heritage across the world. The City of Bath was inscribed as a World Heritage Site in 1987. Bath is one of only two cities in Europe for which the entire urban area has World Heritage Status (the other is Venice). The landscape setting of the city was one of the six reasons why Bath was granted World Heritage Site status (Bath’s ‘Outstanding Universal Value’). Prior Park Landscape Garden was acquired by the National Trust in 1993. A major restoration project was started in 2003 to reveal and restore features in the garden such as the Serpentine Lake and the Grotto. The Palladian Bridge, one of only four which survives, is the most famous feature in the garden. The garden offers fine views over Bath and access to the ‘Bath Skyline’. For further information about the World Heritage Site please visit http://www.bathworldheritage.org.uk. World Heritage Day details can be found on www.bathworldheritage.org.uk/events.